SFD 14 – Update 2nd March 2018. We had planned on bringing you the SFD 14 total in February ahead of the presentation as we normally do. Unfortunately due to the extended illness of the treasurer we are slightly behind on this but the good news is we should have a total by the end of the month (March 2018) and we will be presenting the cheque to Isla Denoon from Sheffield Hospitals Charity at one of Sheffield's football stadiums. 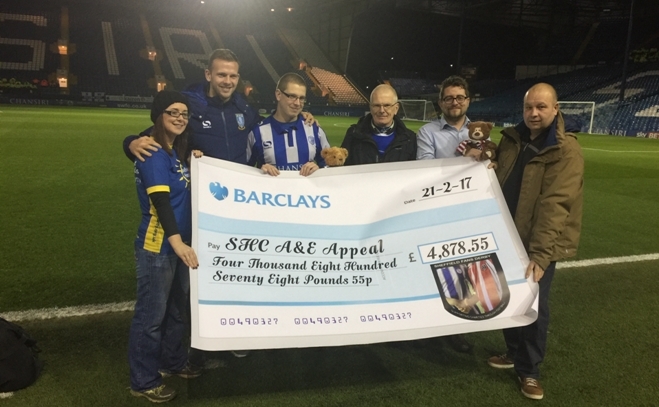 Below: Last time the cheque presentation took place at Hillsborough on 21st February 2017: (Left to right) Isla Denoon, Jordan Rhodes, Iain Atkins, Steve Atkins, Matt Phillips & Neil Tilbrook.